That's right. 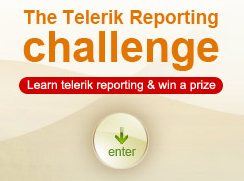 It's time for another fun Telerik challenge, this time for the new Telerik Reporting product. This new contest begins today and runs through July 13th and it is your opportunity to win some prizes just for checking out Telerik Reporting. To compete in this competition, you need to visit the official Telerik Reporting Challenge page and fill out a short 11 question survey. You'll need to download and install Telerik Reporting to complete the survey (obviously), so make sure you stop by the Client.net area and download your free copy of Reporting before doing the survey. First prize in this challenge is a 19" NEC LCD monitor, but everyone who gets at least 7 of the 11 survey questions right gets a free Telerik Reporting developer license (which is probably worth more than the monitor). Do yourself a favor and take a few minutes to try Reporting and complete the challenge survey. It will be the easiest $400 prize you've won all week!